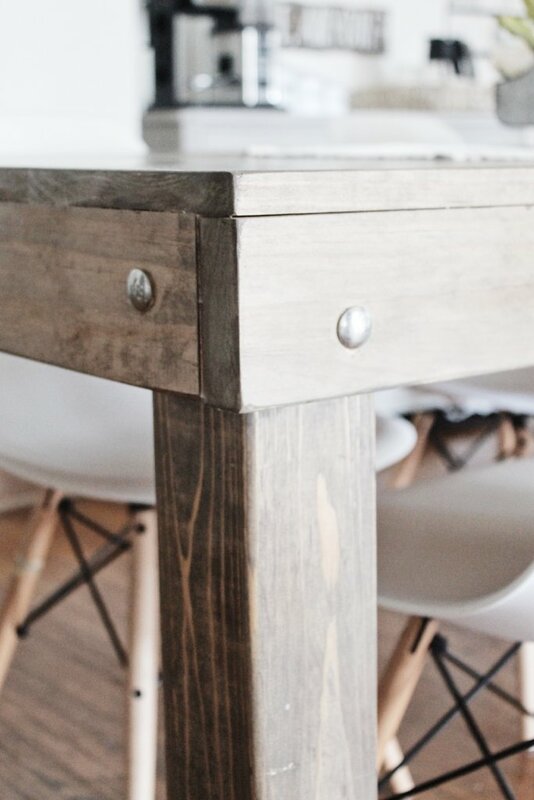 One of the very first woodworking projects my husband made for our new house was this DIY Farmhouse Dining Table. I honestly have no idea how I forgot to show you guys this beauty! 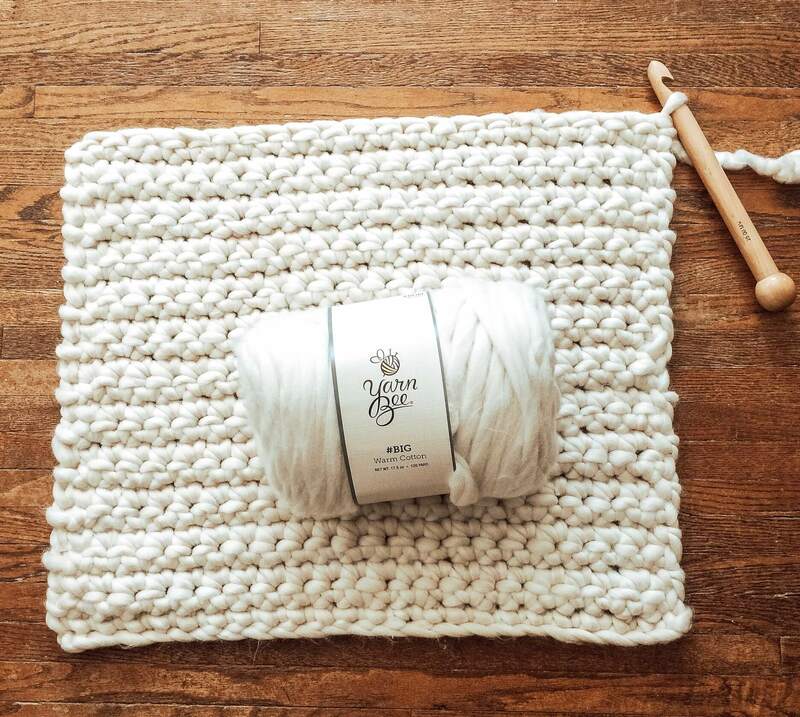 I get a lot of questions about this table on Instagram, and I hope to answer them for you today. The thing I love most about this table is how inexpensive it was to make. I know I don’t have to tell you that you can easily drop thousands of dollars on a large farmhouse inspired dining room table, but this one came in at under $200!!! 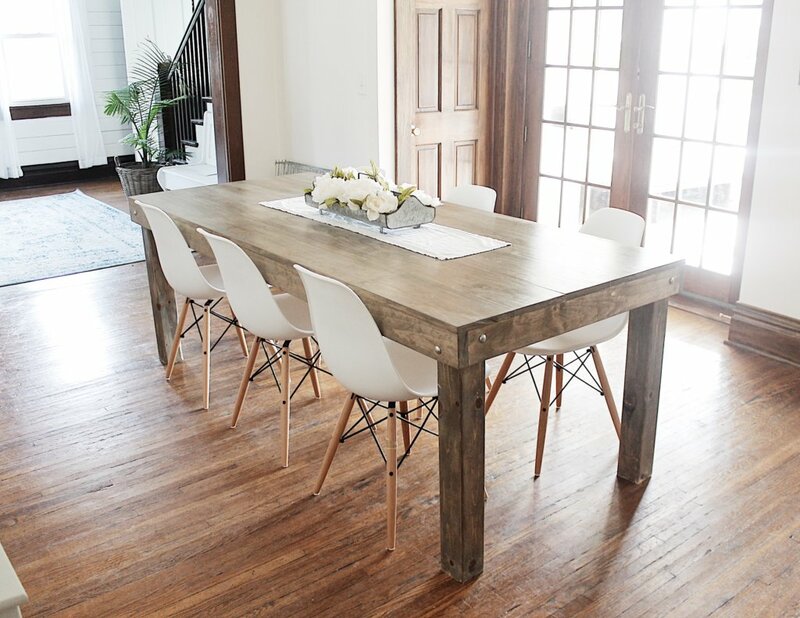 This DIY farmhouse dining table truly was a labor of love–I designed it, my husband built it, then I stained/polyurethaned it! Like every other thing my husband has ever built, I don’t have specific plans to show you, because he makes up everything in his head as he goes along. However, I’ll show you the details so you can get an idea of what we did, then make it your own! Warning: if you are a professional woodworker, you might find what we did to be blasphemous! 😉 We really don’t know what we are doing, but it just goes to show that anyone with a saw can make themselves a gorgeous table for not a lot of cash! We host a lot of get-togethers, so we wanted a table that could accommodate a crowd. Our table is 7 ft long, and comfortably fits 3 on each side plus 2 on the ends. Obviously, you can make your own table longer or shorter to fit your needs! Another consideration that I deliberated on for WAY too long was how high to make the table! I hate sitting at a too-high table, but we’re also tall and have tall family members. I didn’t want it to feel squatty. We settled on 30 inches high and I think its just absolutely perfect. I liked the exposed metal bolt, as I felt it added to the character, but you could use nails or something less visible if you aren’t into it! After it’s assembled comes the fun part–staining! I used a new combination for this diy farmhouse dining table, and I’ve got to say, I think it came out great! First, I started with a very thin coat of Minwax Walnut stain. I wiped it on and then wiped it right off, because I didn’t want it to be too dark. Once it dried, I used a VERY light wash of Classic Gray, also from Minwax. Again, I did not allow it to sit, but wiped it right off. I think it created the perfect amount of “age” without looking too distressed or crazy. And there you have it! 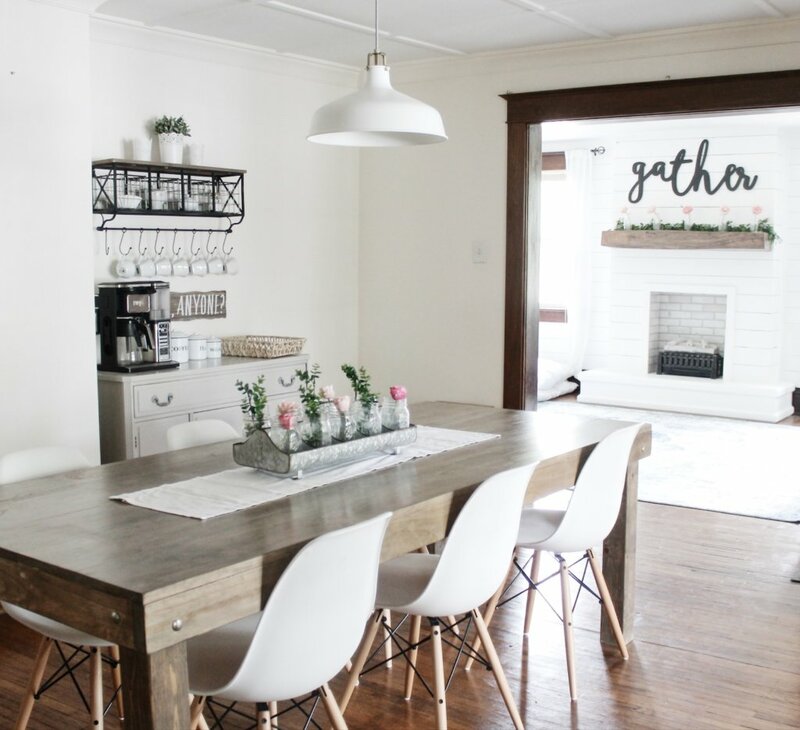 An easy, inexpensive, DIY farmhouse dining room table! I hope you guys are inspired to make your own!! Hi! 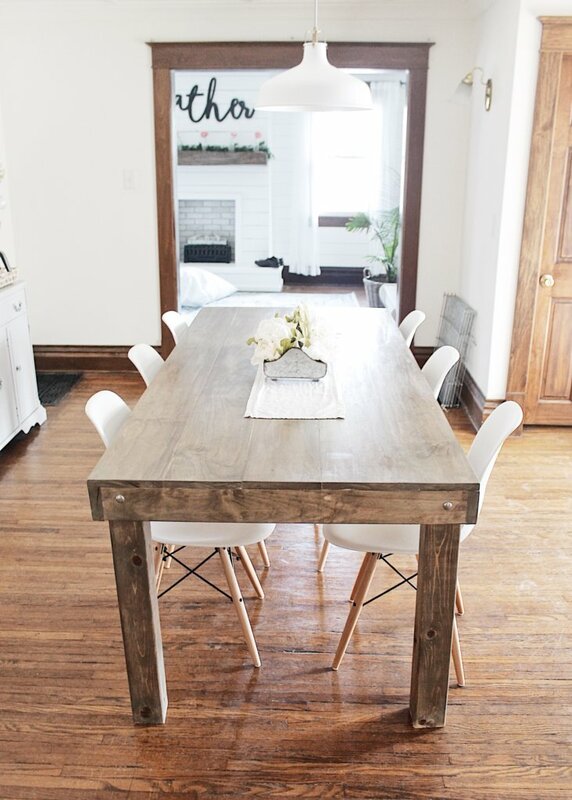 I absolutely adore this table (and chairs) and am hoping to make something similar. I’m wondering about what kind of wood you used? And for the legs? Did you just buy the posts already cut? Thanks for your time! Hi! Thank you so much! The top of it is premium 1×8 pine, and the legs are regular ol’ 4x4s. I hope that answers your question!! !